Digital Evolution: the business equivalent of boiling a frog! Digital Transformation is all the rage at the moment. Microsoft is focussing its entire business on it; its CEO, Satya Nadella, has said that, “Every business will be a software business” (Computer Weekly, March 2015). However in the small and mid-size market we’ve found many businesses reluctant to embrace Digital Transformation for a number of reasons. Last week, CIO Magazine published an article entitled “12 reasons why digital transformations fail” – yes I know it sounds like click bait, but it’s worth a read. It’s primarily about projects that fail in major enterprises, but the reasons the survey identifies are very similar to those which cause smaller businesses to be suspicious of, or reluctant to embrace, Digital Transformation. I’m not going through all 12 reasons here; read the article. But I am going to pick out three relevant ones. Resistance to change – this is also true in smaller businesses, many of which are content with the way their systems and processes work. Although the senior team knows the systems could be improved, the risk of breaking everything while trying to improve them is perceived as too great and too big a distraction from running the business. Furthermore, the bigger the project the bigger the risk of it failing and making the business worse rather than better. Back end focus cramps customer innovation – The article suggests that CIOs are too intent on their own domain, focussing digital transformation on the technology, particularly back-end systems, ignoring the business itself. The drive and initiative for transforming the business should come from the top of the company, from the CEO or owner, and be focussed on delivering a better, lower cost, more innovative customer experience. Of course automating and driving costs out of back-end systems can improve both profitability and customer experience, but these changes should be a consequence of improving customer service, rather than being the primary reason for the project. Strapped for cash – this is also an issue for smaller businesses who are unable or unwilling to budget for a major Digital Transformation project. In a major enterprise it may be that the project grinds to a halt part way through – in smaller businesses it simply never starts. Digital Evolution – how to boil your frog! Nothing is so painful to the human mind as great and sudden change. People in all walks of life are generally resistant to significant change, preferring small incremental changes. Evolution is better than revolution. The analogy a friend uses is that of boiling a frog. If you drop a frog in a pan of boiling water, then it will leap out immediately, but if you put it in a pan of cold water and then gradually raise the temperature, it’ll never notice, and will eventually cook. (Don’t try this at home, it’s not good for the frog.) The principle in business is the same – people accept and embrace gradual change where they would resist something more major. With this in mind we’ve developed a methodology we call Digital Evolution. The ultimate objective, using digital technology to transform a business to deliver better, lower cost and innovative customer products or services, is the same. And it still should be driven from the very top of the business, focussed on the customer. But we split the project into smaller incremental steps. If you’re familiar with the terminology, what we’re doing is applying the principles of agile development to the transformation project. We build the project up in small, self-contained incremental sub-projects (sprints) each of which is constrained in both time and budget, but each of which delivers real business value to a particular area of the business. It may be moving the server systems into the cloud – if that’s the appropriate first step – or it may be automating a currently manual process, or adding mobile capabilities for customers or workforce. But each step improves functionality or reduces cost and complexity. Budgets are allocated to each step. After any sprint the business can pause, or stop, and still have a working, functional business. Staff adoption is far better because it’s far easier for people to adapt to small changes in processes or systems than it is to learn an entirely new way of working. So the chances of success are higher and the risks of failure and of cost overruns are much lower. 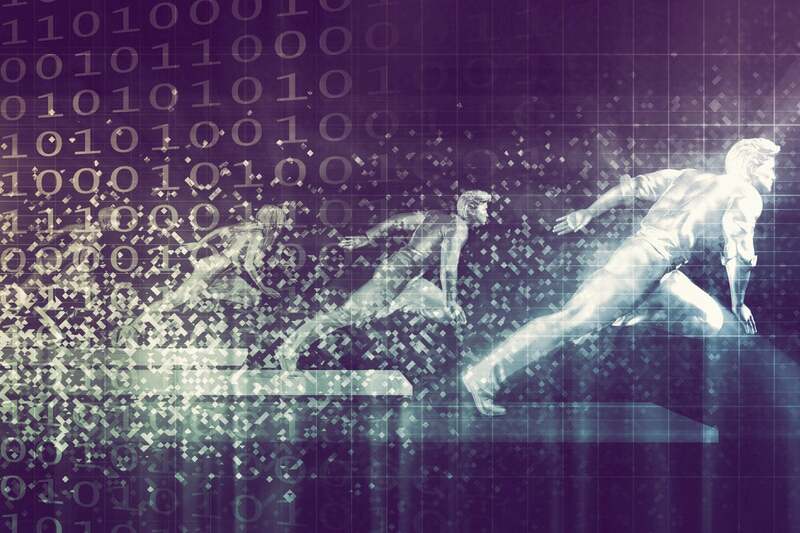 It may take longer than a major Digital Transformation project, but Digital Evolution is more acceptable and more likely to succeed. If you want the frog to boil, cook it slowly, while gradually increasing the heat! Contact us to find out more about how Digital Evolution could help your small or mid-sized business embrace digital technology without the risks of failure associated with Digital Transformation. Mike, very good article. Small incremental changes, repeated frequently, will much more likely lead to significant change, over a relatively short period – the frog will never notice. Your analogy of agile development is a good one. For those not in development, think of the power of compound interest.